I don’t believe that the primary role of science fiction, in any form, is to teach us; about science, or about anything else for that matter. Didactic fiction is usually pretty grim stuff; didactic science fiction, especially. If I want to read about rocket ships or space stations or nuclear apocalypse, I turn to non-fiction. On the other hand, I do believe that one of the things that science fiction can do is to speculate about how the future might feel. I use "feel" rather than "look" quite deliberately. We can take turns to ever-so-ironically point out that Bladerunner is set in 2017 and gripe about the fact that we still haven’t got our flying cars and jetpacks, but to do so is frankly tedious and facile. The point is, we are forever teetering on the brink of actually living in the future, one second at a time, and we not unnaturally think about what that future is going to be like. I was a young adult in the late 197os/early 1980s and I genuinely believed that I would not get as far as my thirties, because the threat, real or imagined, of nuclear war loomed so large in my life. Almost all the science fiction I read was extremely pessimistic; I knew my chances of survival were poor, doubly so because of my gender. What I see now but couldn’t see then was just how white and straight that science-fictional future also was. Time passes, and slowly, painfully, agonisingly, science fiction begins to get its act together. By fits and starts we begin to see better representation of women, people of colour, people who are not American or British, marginalised groups, LGBTQIA people. Having said that, this representation is by no means evenly distributed; intersectional representation is clearly one thing that really needs to be worked at right now, and I do not doubt that there are other issues waiting their moment. I find it strange that for so many people who live in a world that is inevitably intersectional, the idea of fiction representing the quotidian world, showing people who contain multitudes, is still a concept too far. One might argue, I suppose, that science fiction is not realism, but insofar as much of it attempts to represent a realistic future, there is surely something—a lot of somethings—missing. As I once searched for representations of women like me, so other groups search for representations of people like them. A key word here is surely "people"—plural, rather than individual token representatives. And critically, they’re looking for life-affirming representations. We can joke about the Star Trek "red shirts" easily enough but way too often for the person of colour, the gay couple, the non-American … well, it is not going to end well, is it? Tragic renunciation at best; at worst, death. Recent appeals for "positive SF" have brought forward yet more lists of novels by mainly white male authors, set in gung-ho mainly white futures. 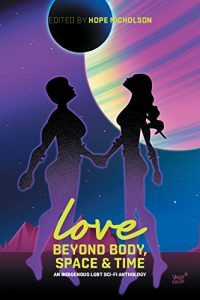 I daresay it’s a comfort to them, and at least they have noticed that women now have brains, but if this is positive and life-affirming.… This brings us, then, to Love Beyond Body, Space and Time: An Indigenous LGBT Sci-Fi Anthology, edited by Hope Nicholson. All of the stories in this collection are by indigenous writers, LGBT and/or two-spirit and their allies, and they deliberately employ science fiction as a way of imagining a future that is positively indigenous and positively LGBT, but also simply, plainly positive. The first story in this collection, Richard Van Camp’s masterly "Aliens," sets the tone for the enterprise. There are indeed aliens present: the "Sky People." Their ships are huge, shadowy presences; they are apparently cleaning the oceans and the rivers without harming the wildlife. But that is pretty much by the by. This is a story about people, and about community. "So, some of us—like me—still go to work. The Sky People are here but the bills don’t stop. Plus you gotta get out of the house, right? You gotta check the mail and get groceries, hey?" And so the narrator launches into a story about her niece, Shandra, and Jimmy, the boy who never left town, unlike all the other kids. If you’re familiar with some of the structures of Native American storytelling, you’ll see them at work in this story—we learn of the narrator’s own connection to Jimmy through her grandfather, the healer, who once cured one of Jimmy’s relations, meaning "me and Jimmy are related in the medicine way." But the story is not about the narrator but about her niece, Shandra, and about Jimmy’s slow, gentle courtship of her. We learn what they say to one another, what they do together, but what we never learn is who Jimmy is. The Aunties may speculate like fury about it but Shandra isn’t saying. But what we do learn is that Jimmy is fascinated by other people’s lives, much as the narrator is fascinated by him, by his nature. It’s left to the reader to speculate, too. The story’s title pushes us one way, because we read science fiction, but what sticks with me about this story is that sense that whatever Jimmy is, he has always been a part of the community. Granted, this story takes a particular angle, but why not this angle? In her introduction to the collection Grace L. Dillon notes "Two-spirit natives swim hard among cultural currents." For not only are they "resisting both colonial gender binaries and sexual regimes imposed by the legacy of nineteenth-century white manifest destinies," but some must also deal with "scepticism and rejection by some traditional Native communities." Thus, these stories are, as the subtitle to her introduction has it, "two-spirit survivance stories," and Vandercamp’s story is the embodiment of this. Survivance is significant. Jacques Derrida used it to denote a spectral existence that would be neither life nor death. Used this way, it is a word that evokes how, even now, we are still encouraged to think about indigenous populations in heavily colonised countries. It is implied that they live, so to speak, in the "cracks of your world machine"; they are lost, vanished, easy to romanticise in their seeming absence. The same is too often true of the LGBTQ community, even more so if one is already part of an invisible community. But the term has since been co-opted by the Anishinaabe scholar, Gerald Vizenor, who first used it in his book Manifest Manners: Narratives on Postindian Survivance, and made it a central tenet of his analyses of Native American literature, culture, and politics. Vizenor defines survivance as "an active sense of presence, the continuance of native stories, not a mere reaction, or a survivable name. Native survivance stories are renunciations of dominance, tragedy, and victimry" (Manifest Manners vii). That is, Vizenor takes Derrida’s spectral presences, transports them into the contemporary world, embodies them once again, and gives them agency. He is in part as playful as Derrida himself might be (and that –ance ending might well make us think of jouissance, another Derridean usage), but there is nonetheless an urgency in his argument for the renunciation of what he calls victimry. And there are no victims here. Certainly not Auntie Dave, who takes in the narrator of Cherie Dimaline’s "Legends are Made, Not Born," after his mother is killed in an accident. Only gradually do we realise that where they live is not Earth—Old Earth—but New Earth. Auntie Dave describes what the evacuation from Old Earth meant to the indigenous peoples: the last to be evacuated, not allowed to bring much with them, and the choices they made as a result, and in particular the choices made by the two-spirit peoples. It’s a very short story but we see a future in which the best of the past also continues, not just preserved, but made real. Daniel Heath Justice’s "The Boys Who Became the Hummingbirds," a story he calls "a Teaching, and a Remembrance," is perhaps closest to what those unfamiliar with contemporary Native American writing might expect of indigenous storytelling, but we have no idea where in time those "far ancient days" are located. I read it as a teaching from the future, not the past. Yet, set this traditionally framed tale against Darcie Little Badger’s "Né Łe," clearly set in the future, and an uproarious tale of love and Chihuahuas in space, along with glimpses of a future in which there is a Diné orbiter, "sovereign Navajo territory," and a perfectly ordinary part of the off-Earth world, though there are hints that even this habitat is more utilitarian than, say, the Mars colony where Dottie expects to be looking after the pampered colonists’ equally pampered dogs. The two stories couldn’t be more different if they tried, yet both clearly emerge from the same traditions of native storytelling. Humour has always been an important part of indigenous storytelling. Other stories deal directly with the process of transition. Gwen Beneway’s "Transitions" focuses on an unnamed narrator, a trans woman in the process of transitioning, her encounter with an Anishinaabe Elder, and her gradual recognition that, as the Elder puts it, her female ancestors have found her and are acknowledging her. Mari Kurisato similarly explores the process of transition, but a very different, more overtly science-fictional way, as a cyborg moves towards becoming human. What is at issue here is the colour of Aanji’s blood, black rather than red, but it is not difficult to see that this story also interrogates the white obsession with Native blood—how much of it do you have to have in order to be indigenous. And there are love stories here, too: David A Robertson’s "Perfectly You" is a complex story of love and possibility, as Emma tries to come to terms with whether or not to initiate a relationship with Cassie, using a virtual reality program to help her make that choice. Nathan Adler’s "Valediction at the Star View Motel" explores the hesitations of first love, between Eadie and Mushkeg, the girl who claims to speak to spiders. In tone, it’s much like Van Camp’s story, discursive, firmly rooted within the community, hopeful. There’s only one poem included in this anthology, but it is overwhelming. Cleo Keahna’s "Parallax" is a short, powerful weighing-up of a person’s identity. In his introduction to this collection, Niigaan Sinclair, comments that "Two-spirit people […] have been living, loving, and creating art since time immemorial." And as Qwo-Li Driskill, Daniel Heath Justice, Deborah Miranda, and Lisa Tatonetti tell us in Sovereign Erotics: A Collection of Two-Spirit Literature, "Queer Native people are far from a monolithic group. We have numerous identities, artistic stances, and political agendas. We come from diverse nations, land bases, and traditions." Love beyond Body, Space and Time can only hint at the breadth of that group but it does represent to the world, and most importantly, to two-spirit people themselves, that they are a part of science fiction, precisely as they are a part of the everyday world. Maureen Kincaid Speller is a critic and freelance copyeditor. She has reviewed science fiction and fantasy for various journals, including Interzone , Vector , and Foundation , and is assistant editor of Foundation .